On a recent weekend trip to Washington, I was running in Rock Creek Park when the water and coffee I’d had that morning caught up with me. I’d run there only once before so was unsure where relief lay. I’m also a woman, so I couldn’t just pull over to the nearest bush or tree and relieve myself discreetly, the way guys do, through the benefits of outdoor plumbing. And then, like a beacon of hope and light, just as the need became painfully pressing, I came across a Porta-Potty. One big problem: It was perched on the side of the road, inches from two lanes of traffic, with a door that opened into those lanes. I waited for a gap in traffic, opened the door, ducked in and did the deed greatly relieved, but through it all hoping that a stiff wind wouldn’t push me over into the road or that I would meet my demise on my way out. When to go and where to go is a tricky issue for female runners. On training runs, at least I can plan. I make sure my route intersects with at least one coffee shop, fast-food restaurant or that one Porta-Potty in the park near my house that’s always clean. But races can be far more unpredictable. One choice is to throw modesty to the wind and simply bare all. But that involves some deep squatting — not something that’s always easy to do on race-weary legs. The problem is made even worse if, like me, you wear shorts that are tight instead of baggy and must be pulled all the way down to the knees to go. Another option is to give up many precious seconds, or even minutes, waiting in line for a Porta-Potty that may or may not be where you need it, when you need it, and then going through the motions to get out of your shorts, then back into them. Or, you can always just let it go and hope that no one notices. 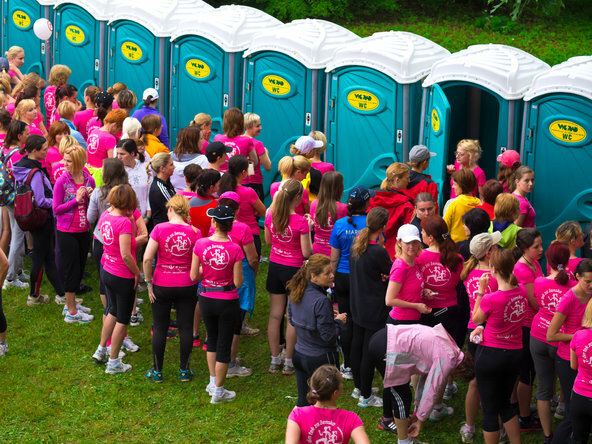 One female runner I know, who asked to remain anonymous, couldn’t get through the bathroom line at the start of the 2013 Philadelphia Marathon. So she let loose as the race started, grateful that she was wearing sweat wicking tights, which she told me dried fast. Where to go isn’t a problem limited to amateurs, either. During the 2005 London Marathon, Paula Radcliffe stopped on the side of the racecourse to relieve herself — in the sight lines of a media truck — and then went on to win the race. Before the 2013 Boston Marathon, both Shalane Flanagan and Kara Goucher didn’t have time to get to a Porta-Potty before the start, so they asked race officials to block the view from the crowds at the start. The officials obliged, using their bodies as a shield. To release the hatch, “You lift the skirt up, open the Velcro from the front, the flap comes down and there’s an opening that’s anatomically positioned,” said Nicole DeBoom, the founder and chief executive of Skirt Sports. The trap door is adjustable, to provide a personalized fit and accommodate women who want to wear sanitary napkins while running as well. The idea for the product, Ms. DeBoom said, came from their customers, who complained about incontinence issues arising from pregnancy, childbirth or aging. She’d also heard from women who told her they wouldn’t drink anything before a race because they didn’t want to have to stop to relieve themselves — a potentially dangerous situation that could lead to dehydration and serious medical issues. But really: Would anyone buy a skirt with a hole in it? To float the idea, Skirt Sports put up a Facebook post on April Fools’ Day 2015 envisioning “some kind of magical skirt that knows when you’re about to pee and opens up,” Ms. DeBoom said. Some 2,000 female runners responded with their ideas about what they would use the skirt for, with relieving themselves and replacing tampons or sanitary napkins during heavy periods at the top of the list. That led to a Kickstarter campaign, which drew 800 supporters who pledged $ 75 each. Contributors will receive their Gotta Gos once they become available. Ms. DeBoom says that if the feedback is positive, they’ll consider adding it to Skirt Sports’ regular line in both short and Capri length. Though I’m not a huge fan of running skirts — the extra swishing bothers me — at least someone is working on a solution. Until then, I’ll keep waiting in long Porta-Potty lines, or hope I’ll be able to enlist a fellow runner to shield me should I need to peel off to the side of the road. Or, I could always learn to do what the ultramarathoner Deborah Paquin learned to do: go standing up. She got the idea in the late 1990s, after getting stuck in a Porta-Potty at the start of one race then, in another, accidentally mooning a fellow runner. “I needed to find a better way,” she said. After a few mishaps, she found success “if I tilted my pelvis under a little and spread my legs wide enough and really engage my abs.” Personally, I’m not sure I’m up for the trial and error.